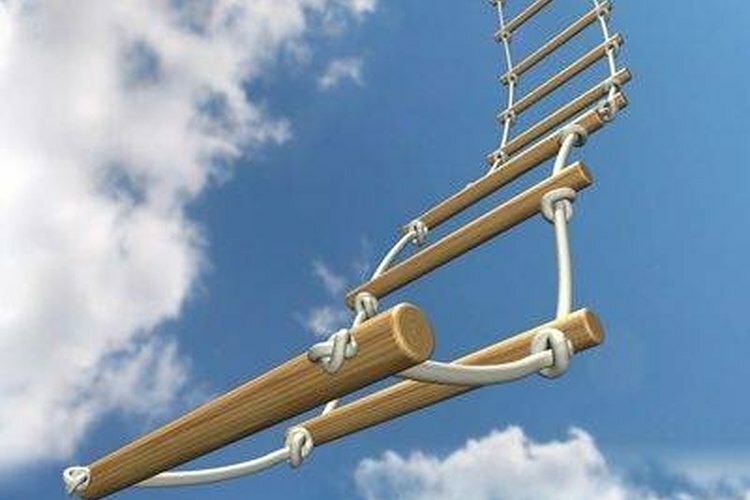 A rope ladder is one of those things that appears almost effortless if you are observing someone skillfully climbing one; however, there is a technique to successfully climbing a rope ladder. Keeping yourself centered on the rope ladder is a key to maintaining your balance. Once you understand how to stay centered and balanced while climbing a rope ladder, reaching the top should be possible for many people. Stand facing the rope ladder with your body centered with the rope ladder. Step onto a rung at the point that the rung meets the right side rope with your right foot. This will give you the most support for your foot. At the same time that you step onto the rung, begin to pull yourself up the ladder with your hands and arms moving your left hand up the left side of the rope ladder. You must keep your body weight evenly distributed on the rope ladder or you will lose your balance. Climb slowly and carefully up the rope ladder moving your opposite foot and hand together each time. Moving the opposite foot and hand together will help keep your body balanced and centered on the rope ladder. A rope ladder is nothing like a traditional ladder. In order to successfully balance yourself and climb a rope ladder, you must approach it differently from a traditional ladder. Balance and sequenced motions are the key.